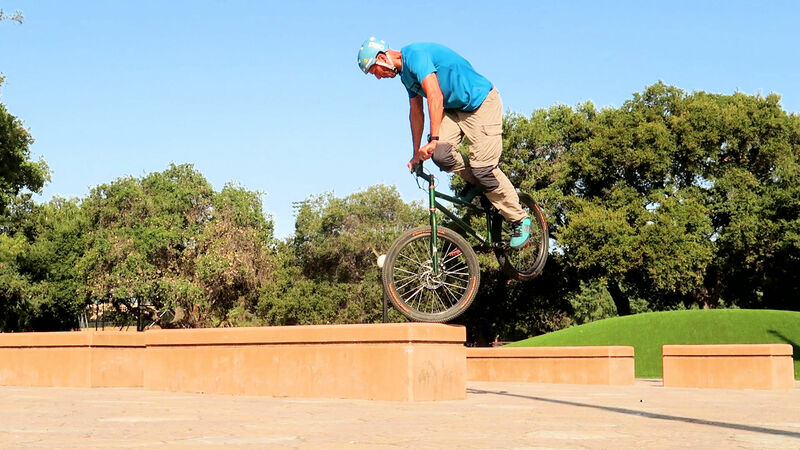 The footjam tailwhip is a classic street move directly imported from the BMX scene. Simply put, you jam a foot on the front wheel against the fork to whip the frame around and catch your pedals as the frame swings back to you after a full revolution. The hollow stem cap keeps the front hose tidy. 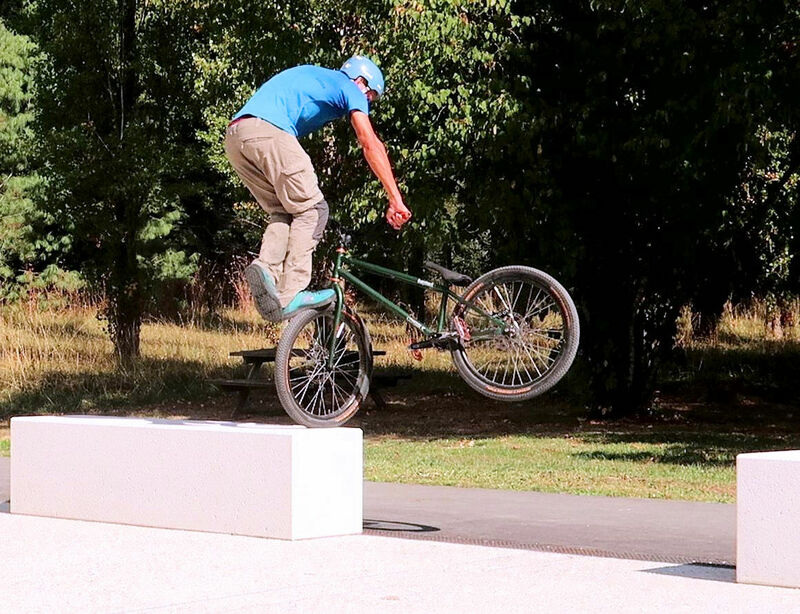 Once mastered, the footjam tailwhip blends well with a front wheel pivot, to drop of a wall with style. As for any move involving full bar spins, make sure that your brake cables or hydraulic hoses won't get entangled with the frame to a point it could lock the rotation. That's why most street bikes sport a fairly loose rear hose while the front brake hose passes directly through the stem cap and is neatly tucked under the fork. Before you can jam your front foot, jump over the frame. The footjam tailwhip starts pretty much like a 45° endo, a quick stop while pivoting slightly on the front wheel. But rather than stay on the pedals, you want to take one foot off its pedal and plant it on the back of your front wheel, while at the same time whipping the frame sideways with your other foot. Then the trick is to maintain your balance there until the frame has completed a full turn around the steering tube. Properly jamming your foot (front or back) onto the front wheel is probably the trickiest part of the entire move, since a bad start will likely compromise your balance and exit. You'll be swinging the frame in front of you from your front foot side to your back foot side (anti-clockwise if you are right foot forward and clockwise if you are left foot). Then, you've got two options, either jamming your back foot (probably the easiest to start with), or jamming your front foot (which implies jumping over the frame first and requires a bit more practise to nail properly). For better balance, try to jam your front foot straight along the tyre's thread. In both cases, lock both brakes and try to jam your foot straight along the tyre thread, you'll achieve a better counter-balance as the frame spins to the other side and you'll be much better positioned to jump back on the pedals, in line with the frame. Locking the rear brake ensures you'll have proper support when reaching for the pedals, it will also prevent the rear wheel (and the pedals) from spinning randomly. Although it looks easier, jamming your foot perpendicular to the tyre thread places you 90° off line from the frame when it swings back at you, making it more difficult to align with it as you catch the pedals. The front foot jam technique may be trickier to initiate because you have to hop over the top tube, but it is much easier to catch as your front foot ends up on the correct side of the frame when the latter swings back. 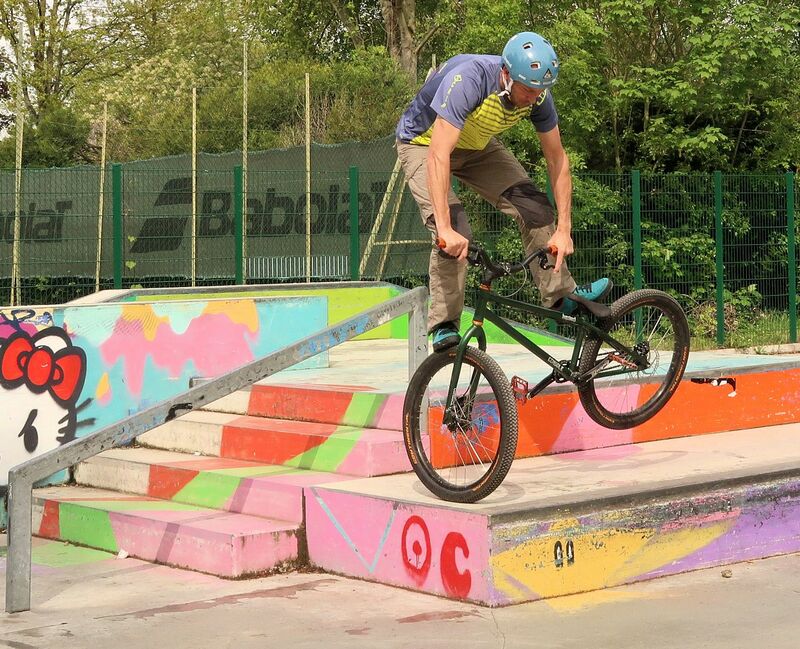 It will take some practise to place your front foot consistently, without landing accidentally onto your front brake hose or missing the front wheel altogether, but let's focus on this variant of the footjam tailwhip. Moving along at a walking pace, launch a small endo, pivoting about 45° around the front wheel with a swing of your hips, but maintaining your centre of gravity over the front wheel. As you lift the rear wheel and start pivoting, push or kick the frame away from you with your back foot (flex the knee) before you take your front foot off the pedal and hop it over the top tube. Then jam your front foot against the tyre and the fork and accelerate the frame swing by pushing the handlebars down (tilting the steering tube forward). The frame mechanically swings towards a lower position to the other side. You can counter-balance this acceleration and the forward tilt by raising your back foot if necessary. As the frame reaches about 180° of rotation, pull on the handlebars to bring back the steering tube to a normal position. This lifts the back wheel up and gives the frame another round of acceleration on its way back to you. When the frame completes the full rotation and re-aligns beneath you, clear your back foot over the top tube then jump off the front wheel and clamp the frame with your legs to reach for the pedals with your feet. 1° Launch a small endo, pivoting about 45° around the front wheel with a swing of your hips, stay centred over the front wheel. 2° As you lift the rear wheel and start pivoting, push or kick the frame away from you with your back foot. 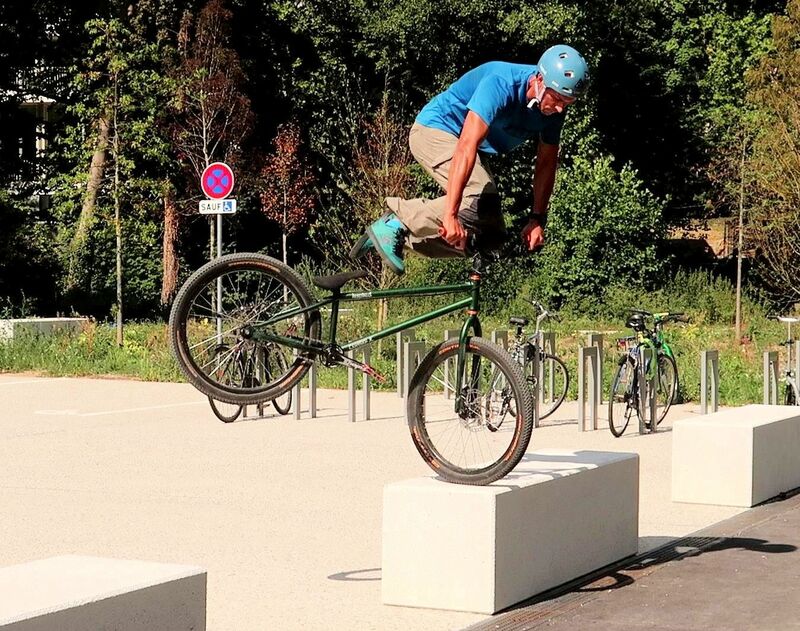 Hop your front foot over the top tube. 3° Jam your front foot against the tyre and the fork. Accelerate the frame swing by pushing the handlebars down (tilting the steering tube forward). 4° As the frame reaches about 180° of rotation, pull on the handlebars to give the frame another round of acceleration on its way back to you. 5° Before the frame re-aligns beneath you, push on the handlebars to slow down the frame. Clear your back foot over the top tube, reach for the pedals. 6° With both feet on the pedals, perform a brief push-up to pop out the front wheel off the obstacle, finishing with a 180° nose drop. To prevent the frame swing from destabilizing you, it does help to slow it down as it gets back to you. Do so by pushing down on the handlebars towards the end of the move, this will raise the rear wheel up again and naturally slow or even stop the rotation. 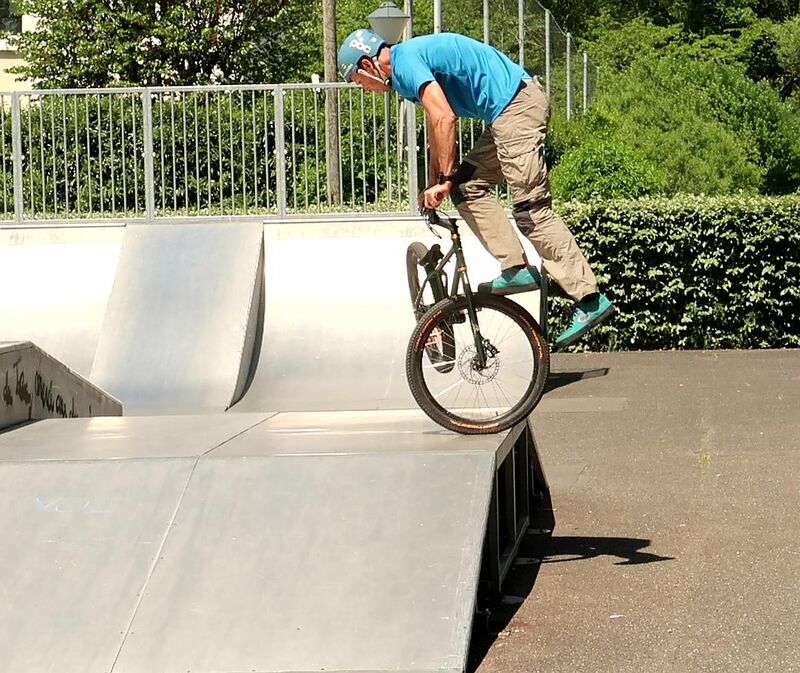 Once you've reached that stage, you can either ground the rear wheel to stop the move completely or if you are onto a wall, pop out the front wheel to finish up with a 180° nose drop. 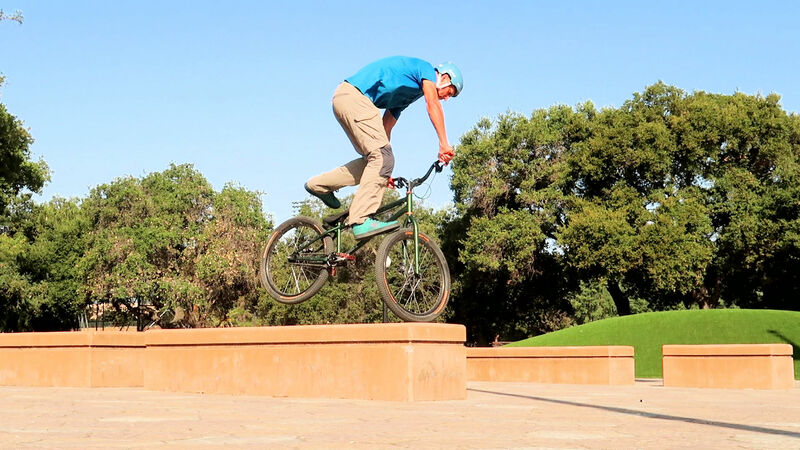 Before tackling tailwhip drops, make sure you nail the regular foot jam tailwhip on the flat, securing both feet on the pedals while comfortably balancing over the front wheel, rear wheel up. It may only take hours of practice to complete your first foot jam tailwhips, but it may take you months or years before you can drop off things with style. You can also check out Jimmy Ertzer's tutorial video to get a different view. The kick sends the frame spinning the other way. The downside tailwhip is an interesting variation, a sort of hybrid move mixing half a tailwhip and half a decade. The frame goes 180° around the steering tube (back foot side) while the rider pivots 180° on the front wheel in the opposite direction before jumping back on the pedals. In all, the whole bike only turns 180°, so you've got to plan for that change of direction in your trick combos. 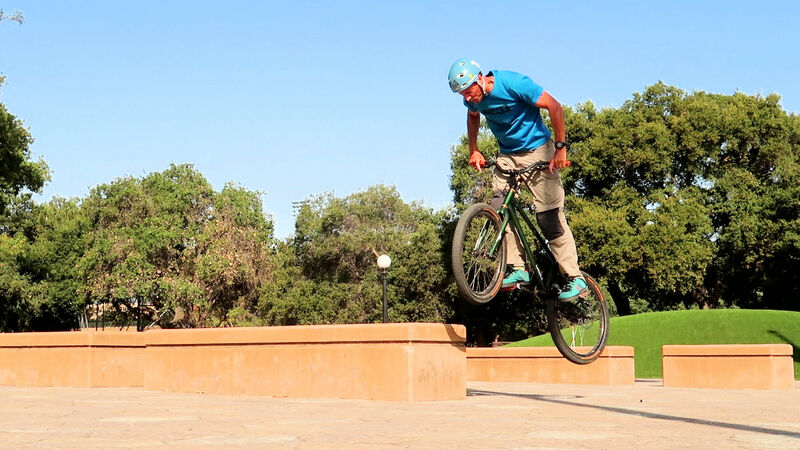 It is much easier to perform than a regular tailwhip because you can jam your front foot without having to jump over the top tube (whipping the frame to your back foot side). Maintain your balance on top of that spinning wheel until the frame comes back at you. 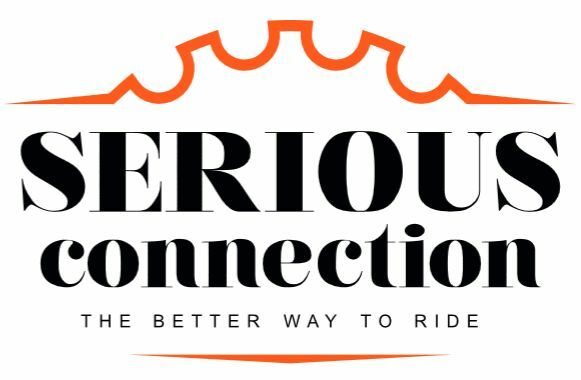 Riding at a walking pace, lock your front brake and turn the handlebars to your back foot side. As you perform a small endo, follow the handlebars with your shoulders and jam your front foot onto the back of the front wheel as soon as it clears from the frame. At the same time, use your back foot to kick the frame (at the seat or the top tube level) away from you in the opposite direction of the turn. The kick not only swings the frame into rotation but also boost your own spinning momentum so you end up in the opposite direction. As the frame comes around, hop your front foot over it and push down on the handlebars to bring it to a stop (this also raises the rear wheel up). Then jump back on the pedals to terminate the move. Ideally, you'd want to end up with both feet on the pedals while the rear wheel is still up in the air, so you can hop your front wheel off wherever it stands. Here again, lock both the front and rear brake, so the pedals stay level and firm. 1° Riding at a walking pace, lock your front brake and turn the handlebars to your back foot side. 2° As you perform a small endo, follow the handlebars with your shoulders and jam your front foot onto the back of the front wheel. 3° At the same time, use your back foot to kick the frame away from you in the opposite direction. 4° Keep spinning on your momentum while the frame spins to the other side of the steering tube. 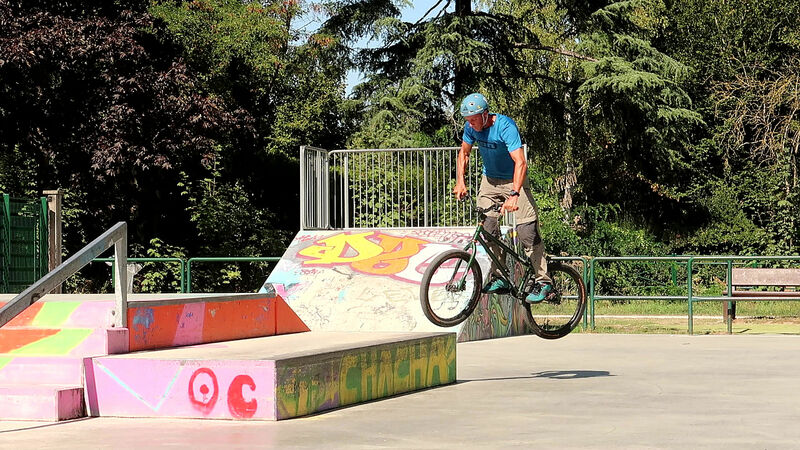 5° As the frame comes around, hop your front foot over it and push down on the handlebars to stop the rotation. 6° Jump back on the pedals to terminate the move, with the rear wheel still up in the air so you can hop from this position. In a flowing combo, you could terminate the 180° downside tailwhip going off a wall, with a firm push-up to drop backwards or to impulse further rotation and land straight. 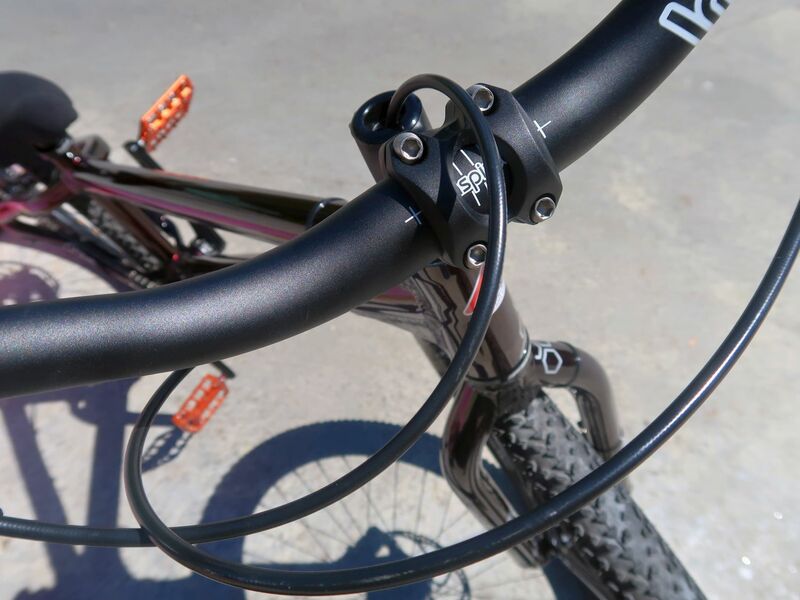 Like for the regular tailwhips, you can control the rotation of the frame (acceleration or full stop) by simply tilting more or less the steering tube, so don't let the frame smash its way into your feet.